You are here: Home / Recipes / 25 Days of Christmas Cookies / Fragrant Christmas Ornaments-Gluten Free!! 1. To prepare dough: in a medium bowl, mix together 1 cup ground cinnamon and 1/4 cup gluten free applesauce using a rubber spatula. 2. Stir in 1/2 cup of gluten free craft glue. Stir the dough until consistency is smooth and dry. Let stand 1 hour. Applesauce gives the dough pliability, glue makes it firm, and cinnamon imparts the fragrance you will remember for years to come as well as the gingerbread color. 3. Turn out one-quarter of dough onto a cool, flat surface; flatten with your hands. 4. Flatten with a rolling pin to 1/4 inch thick. If dough becomes too dry, spritz with water. If it sticks to rolling pin or work surface, sprinkle with additional cinnamon. 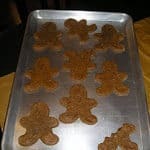 Use your favorite holiday cookie cutter to shape. 5. With a straw, poke a hole in dough at the top (for hanging). Air-dry ornaments on a wire rack lined with paper towels for 24 hours, turning them over every 6 hours or so to keep them flat. Or feel free to preheat oven to 200 degrees. 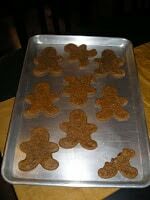 Transfer ornaments to a baking sheet; bake, flipping once, until dry, about 2 hours. Once the dough has dried completely, decorate your lovely ornaments (with glue for “icing” and other crafting supplies) and enjoy for years to come! *Thank you Ms. Martha Stewart for your recipe as inspiration for this one. What kind of craft glue did you use?